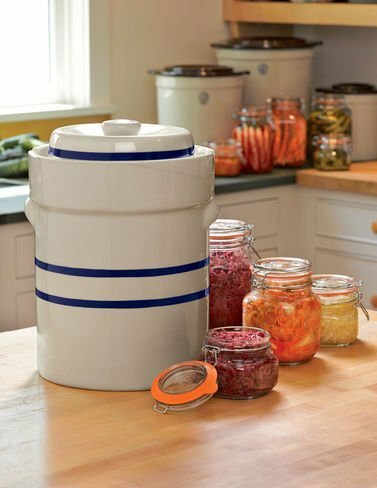 Ohio Stoneware 3 Gallon Fermentation/Preserving Crock Set are certainly multifunctional, from the traditional use of preserving vegetables such as cucumbers for pickles and cabbage for sauerkraut, or for everyday use as pantry or kitchen containers. Crocks filled with food can be kept in a cool, dry environment allowing the vegetables inside to ferment naturally and since they are made with lead free glazes, they are foo safe and easy to clean. They are also conventional oven, microwave, and dishwasher safe. Oldest, easiest and healthiest way to preserve food. Designed for making bountiful batches of sauerkraut, pickles or preserving other foods. Lead free, food-safe glaze will not retain food's flavor, easy clean up! Includes 2 semi circular stone weights and lid. If you have any questions about this product by OHIO STONEWARE, contact us by completing and submitting the form below. If you are looking for a specif part number, please include it with your message.